Marlene Torres, left, says that as a child she grew depressed because her family could not afford for her to speak much to her older brother while he was in prison. With her is Brittany Kane, program coordinator for the CT Children with Incarcerated Parents Initiative. She said that Connecticut now ranks 49th, in front of only Arkansas, in the high cost of phone calls. 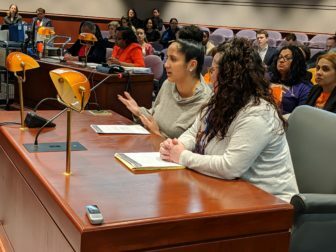 Child Advocate Sarah Eagan said this is particularly important for youths who are incarcerated in the adult system so they can be in touch with their families.